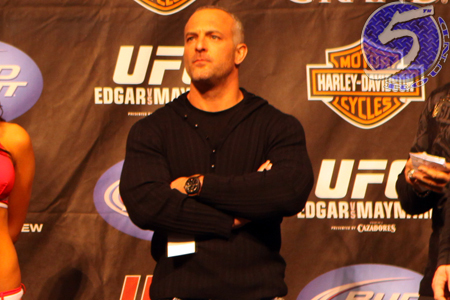 Despite being the only featherweight champion the UFC has ever known, rattling off six straight title defenses since the promotion introduced the division after absorbing the WEC in December 2010, UFC CEO Lorenzo Fertitta (pictured) would have no qualms with arranging an interim title tilt if champ Jose Aldo is unable to return by October. Aldo was slated to defend his throne against Chad Mendes at UFC 176, but the Brazilian was forced to withdraw last week with a neck and shoulder injury. Unable to locate a new suitable main event, the UFC “postponed” (a more PR-friendly word for CANCELED) the August 2 show. According to Fertitta, Aldo’s doctor ordered him to be inactive for three weeks. All parties should know more about Aldo’s road to recovery in roughly 14 days. This marks the third time “Scarface” has pulled out of a UFC title fight due to injury. That being the case, Fertitta is already plotting out Plan B, just in case. “We’ve got some other great contenders in Frankie Edgar and Cub Swanson that could certainly step up and vie for an interim title. We’re going to know more in about two weeks,” Fertitta said on “Fox Sports Live” Tuesday night. “If Aldo’s not going to be ready to go by October, then we’re going to have to sit down to see if we’d do an interim title. Aldo most recently defended his throne against Ricardo Lamas in February at UFC 169. He’s perfect through his past 17 fights, a torrid run that began in May 2006.